I’m writing 2 days in a row. I’m so proud of myself!! Today I’m supposed to tell you about the bunny that lives at the clinic. I like bunnies ’cause they eat all the time, just like me! ‘cept people don’t say bunnies eat like pigs which isn’t fair ’cause I eat my veggies too. 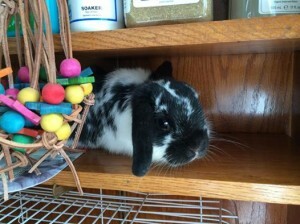 Anyway, Sheldon is a Holland Lop and he’s black and white (they call that ‘broken black’ in the bunny world, though I don’t understand ’cause he doesn’t need fixing…). He likes to try to escape his cage and mom has found him on the shelf above his cage before!! She makes sure it’s locked now!! He likes attention (almost as much as me! ), so if you visit the clinic, make sure you say hello and give him a pat!! 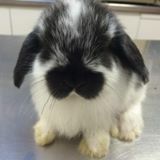 The doctors at the clinic know an awful lot about bunnies and people bring them there for the doctors to look after. They know about pigs too, but us pigs are specialer than bunnies.